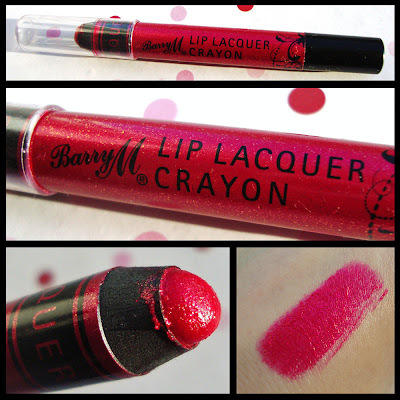 Lip lacquer crayons are the latest addition to Barry M's lip products. They are chubby pencils which are reminiscent of the children's 'Crayola' crayons. I also find the packaging and concept similar to a Nars Velvet matte lip pencil apart from the fact that none of these are matte. There are 5 shades available, I opted to try No.2 a 'Cherry Red'. I personally wasn't expecting the colour payoff to be that amazing. But, the pigmentation is out of this world! See below.. The texture is very smooth, thick yet creamy and very moisturising. It goes on so easily without much thought. The colour itself is pretty, it is indeed a cherry shade of red providing a highly pigmented gloss effect. 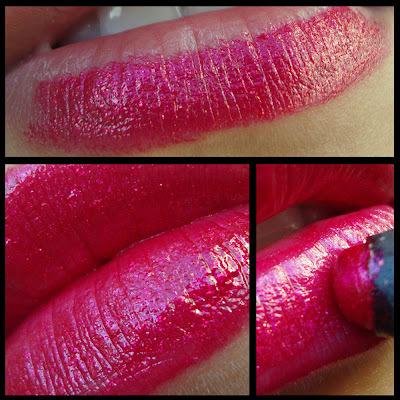 It is very pink toned with hints of blue, and has very fine sparkles for a voluminous effect. My only complaint was that after application it made my lips feel a bit tacky but that feeling went away after a few minutes. I haven't worn this all day so can not comment accurately on the longevity of it, but it feels like it would last forever due to the formula. I honestly don't wear a bright lip that often, and if I do it will probably be in summer time teamed with a white dress, lots of leather and vintage accessories. This colour was a hit with the hubby, usually his immediate reaction to a bright lip is; "What the hell is that on your lips?" this time he said, "it actually looks quite nice". Hmmmm, so can this be the shade of red I can get away with? I think so!! :) I personally really like the shade and look forward to rocking it in the summer. 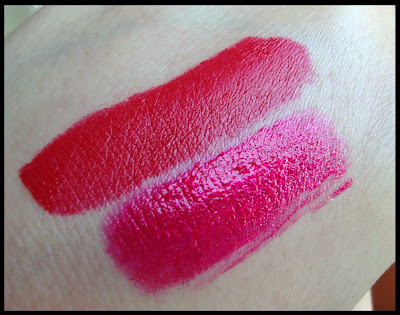 Below, I have swatched a true red lipstick alongside the Cherry Red crayon so that you can see the difference. Price: £4.95 Also available in Scarlet Red, Mandarin, Party Pink and Ballet Pink. 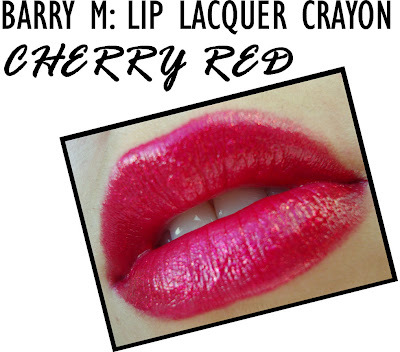 Have you tried the lip lacquer crayons? If so, what's your favourite shade? This product was sent to me from a PR firm for review purposes, I was not paid for this review and I am not affiliated with the brand. This is my honest opinion as always. That looks really moisturising and well pigmented - gorgeous! The colour looks really good, and I love the packaging. However I have a feeling the tip could get a bit messy especially when you have to sharpen it. @Fee Thanks, juat to add I just sharpened it after your comment, and it's fine and in perfect condition so yay! :) I used a Bourjois sharpeneer which has 2 holes, one big and one small. Love this color! Cute stuff! Thanks, for sharing! That looks gorgeous on your lips! I could never wear something so dramatic but I'm definitely thinking of buying the light pink one now I know how creamy they are!! New blog, have a look please! I was gonna go for one of the pink ones but this red one seems so sophisticated and kind of timeless. That's a gorgeous color. That lip pencil was just placed in my shopping list. thats really nice ,def pigmented ,love it! Wow, does it really go on that glossy looking? Beautiful colour! I really want to try out Barry M products. Wow!! what a great colour! Oooh this one looks gorgeous. I have Party Pink but I will definitely be picking this one up too now! The pigmentation and finish of that looks amazing! Im really pleased you done a review and swatch on these been wondering what these were like, DO theu do a pale pink colour? This looks lovely, would like to try out these. It looks gorgeous on your lips.